As South Korean Go champion Lee Sedol continues battling with Google's AlphaGo, political advisor Huang Youyi said, in an interview with China.org.cn, he looks forward to the arrival of the machine translation era. Huang, the former vice president of the China International Publishing Group (CIPG) and the vice executive president of the Translators Association of China, is attending the annual session of the 12th National Committee of the Chinese People's Political Consultative Conference (CPPCC). "Machines can tremendously improve translation speed and complete large amounts of translation work, which can provide more timely language services for economic and social development," Huang said. "But current machine translation application software has too many limitations, and is far away from meeting demands. This also affects people's recognition of machine translation." But Huang said the use of big data may provide a solution. "The use of big data will give machine translation a firm technology guarantee. It can not only improve translation efficiency, but also enhance accuracy," he said. "The more people start to use big data translation, the more accurate the translation results will become. I can say that the big data era will be a time to raise the translation level. And big data translation will provide powerful language service for cultural communication and enterprises' international operation." In the government work report delivered by Premier Li Keqiang on March 5, Li stated that China will boost the widespread use of big data, cloud computing and the Internet of Things, as part of China's innovation plan. Huang is doing more research on the big data translation. "We can build a state-level Chinese-foreign language translation database, and categorize the database into culture, history, politics, economy, law and more. Various entities, such as China International Publishing Group, Xinhua News Agency, China Daily, many state-owned and private enterprises and universities, now have their own translation databases. They should all share and work together to build an ultimate database," he said. 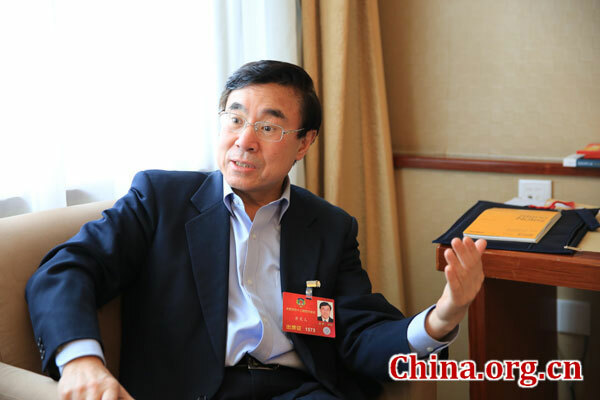 The political advisor said that China is implementing the Belt and Road Initiative and Chinese enterprises are going overseas for more development. "But you can't expect all the foreigners to know Chinese. We really need language services. The human element is insufficient; there has to be involvement of machine translation and other applications. " He continued, "The technology is coming of age. The development of big data translation requires efforts in two aspects. First, the nation and enterprises should speed up research and development, as well as financial input. Second, translation professionals should use this development to extend the machine’s memories and expand the database. The relevant industries should work together."